I love chili. I really love cornbread. My mom made chili for dinner the other night and I was the designated cornbread maker. It turns out that my family also really loves cornbread because the whole batch was gone by the next day. This left me in a (first world) dilemma. 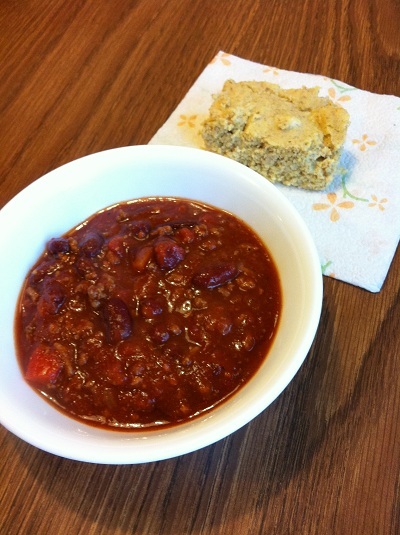 I wanted to have chili leftovers for lunch but I didn’t have any cornbread to go with it. The horror! 2. Add the wet ingredients to the dry and stir until just combined. Use cooking spray to grease a microwavable bowl or (large) coffee mug and pour the cornbread mixture into it. 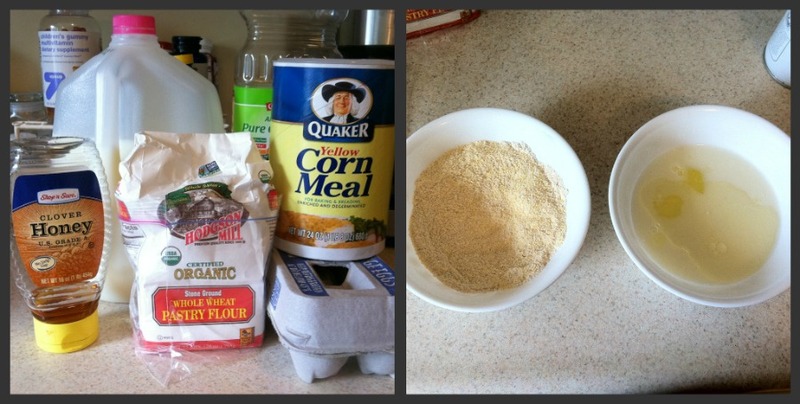 Cornbread you can make in the microwave? GENIUS GENIUS GENIUS! mmmmmmmmmmm I love cornbread too! my mom has a secret recipe cornbread and it includes shredded carrot and poppyseeds. it is amazing. we used to eat it with buttah and a lil honey! OH MY WORD. You have just made my week. Ah, this is such a simple and great recipe! I’ll have to try this because Andy loves cornbread but I don’t–so I end up making a pan and tossing what he doesn’t eat after a few days. I feel like I’m super behind on your blog but am going to go catch up on your recent posts now. Hope all is well, friend! What a great idea! I love the super cute shape the cornbread gets from the small ramekin too! I’m so glad you enjoy the recipe! Would you be interested in more single-serving recipes in the future?! Let me know! That was truly amazing. I love cornbread but cba to make it in the oven. That hit the spot and it was just big enough for one! Genius! I decided to make stuffed sole at the last minute, and I needed some cornbread in a hurry. This saved me over half an hour! Awesome!! I’m so glad 🙂 hope you enjoyed it! Super excited about this! I added 1/2 t of cornstarch (because I think it makes baked goods softer) and I used organic maple syrup instead of honey. I also used coconut oil/milk–loved it! And you don’t use a whole egg because? I’m sure you could use a whole egg if you’d like! I looked up a lot of single serving recipes as research for this recipe and most of them used egg whites, so I based my egg white usage off of my research. If you do make this recipe with a whole egg, let me know how it turns out!